Welcome back to the last day of the October Whimsy Stamps release! 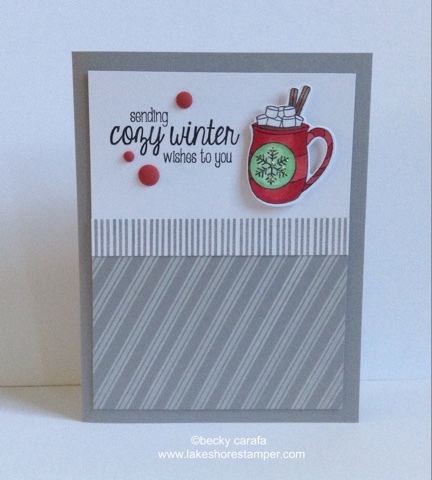 Today I am showing you another card I made with Holiday Sweet Treats stamp set and it's companion die set. I decided to make a steaming hot cup of chocolate, yum! I stamped, cut, and colored the mug and set it aside. I stamped lines from Get In Line with gray ink on a white strip, and white lines on a gray piece. I adhered both of my lined pieces to a white panel, and added the sentiment. The cup is popped up next to the sentiment, and the whole thing was layered on a gray base. I added some dots at the end. Thanks for stopping by, head over to the Whimsy Blog for all the info, and go shopping HERE! Love this Becky! The red mug just pops with the grey backdrop. The stripes of grey across the top is a perfect accent.